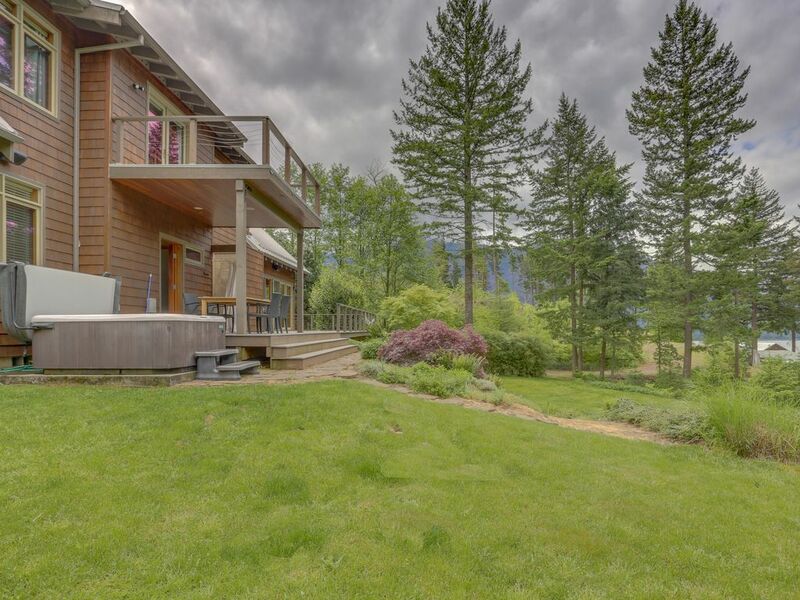 Unlock the incredible natural beauty of the Gorge with a stay in this stunning home in the hills above the Columbia River. Custom-built with old growth logs, hand-laid tiles, and soapstone kitchen counters, this upscale, dog-friendly vacation rental also includes access to a private sauna and hot tub, ensuring your Gorge getaway will be unforgettable from beginning to end. This home is located about seven miles northeast of the city of Stevenson, the outdoor mecca of the Columbia River Gorge. Perched right on the edge of the Gifford Pinchot National Forest, you'll have hundreds of miles of hiking, biking, and cross-country skiing trails just minutes from your front door - not to mention some of the best windsurfing in the world. This home is also located less than a mile from Wind Mountain Ranch, making it perfect for guests visiting town for a wedding. Designed with soaring ceilings, gorgeous hardwoods, and windows that gaze out into the trees, this unique home surrounds you with the beauty of the Pacific Northwest at every turn. Enjoy the scenery while relaxing in the private hot tub, or while curled up inside in front of the wood-burning fireplace. The fully equipped kitchen and open-concept floor plan are perfect for entertaining, movie streaming and free WiFi are provided, and for a small nightly fee, your dog family members are welcome to join you as well! There's no better way to enjoy the sweeping landscapes of the Columbia Gorge than a stay at this beautiful Stevenson home. Book your reservation today! Parking Notes: Up to three vehicles may park in the driveway. The garage is not available to guests. Open kitchen to family room, lovely views, kids loved yard and hot tub. Really nice fireplace. Beautiful house and location! Great rooms for family celebration. Very relaxing!...All the amenities that a spa would have.... very comfortable and inviting, definitely will revisit this home! Had a great family vacation in this beautiful and relaxing home. We thoroughly enjoyed our Christmas vacation in this relaxing family home. We hiked, played games, listened to music, and cooked wonderful meals. The house has everything that is needed for a great time, and the sauna and hot tub is an extra added plus!